My batteries have been bothering me. I had them pseudo-organized, but they were basically a jumbled mess within a container. Little Cougar and I went on a mission to find something to organize the batteries better. I went to the plastic storage bin section first, and then the kitchen storage section next, but nothing was just what I wanted. I made my way to the hunting and fishing section, which I’m not really familiar with, so I asked the worker which tackle box best fit batteries. He said he had never been asked that question before. Ha! I found one that seemed like it would work well and the price was right (only $7!!). A bonus that it claims to be corrosive resistant. That is probably good for batteries, right? I was so happy when I got home and loaded it with batteries, because it worked just like I hoped! Even though Christmas is months away, I can already imagine bringing this to my wrapping station and really carrying it around anywhere I need batteries. Easy, easy. I like easy and simple!! I need to grab some more D’s next time I’m at the store. I always try to keep enough to load a few flashlights in case of an emergency. They always get used! And everyone must keep some 9V around, because when the fire detector starts beeping in the middle of the night, you don’t want to run to the store. Been there, done that! Wow… so clever…I am going to do this today!!! Excellent, economical, and easy!! Nice, Mary! Just a word of warning about 9Volt (smoke alarm) batteries. When replacing them, after you take out the used one, dispose of it immediately. If the best you can do is to put electrical tape over the terminals, then do so, but get them out of the house and garage. One man placed a used one (after changing the smoke alarm battery in his home) in a paper bag to be recycled later. An electrical current “arked” between the terminals and started a fire which resulted in a bit of their home being destroyed. There’s a video of the story on You Tube, where he warns folks to be safe so we don’t end up with his disaster. Thankfully, no one was injured. I apologize for being negative on your post, Mary, but since you brought up batteries, I’d share a word of warning to protect our families and homes. It is always a good thing to protect our homes and families! I have a husband who will not take instruction from anyone especially me. He does things his way even if there is a better way. He is the self appointed battery man in this house. He throws all used, dead batteries into a metal coffee can and keeps them in the basement. When the can is full (takes a long time) he takes the can to the battery recycle center and drops them off but he won’t go for just one or two batteries . After all I’ve read about storing used up batteries I am afraid that this method could cause harm so I asked him to cover the terminals of all dead batteries with a piece of duct tape. He said that the batteries are dead and in a can so not needed. He was afraid I’d do it behind his back so he hid the can from me. Is storing the dead batteries in a metal can safe? I hate starting another fight with him but I’d hate it worse if his stubbornness caused my pets or myself to be killed or in terrible pain from horrible burns in a fire. Help! Tell him “I feel like your need to do what you want to do is a bigger priority than my life.” Don’t talk to him when you are mad, or when he is mad. Show him a brief article, or segment from an article on proper vs. improper used battery storage, and then tell him that you feel like he refuses to do things safely. Is it a strong urge to feel that he is in control? Does he inisist that you do certain things his way, or he gets upset, but he won’t do things your way, even if that upsets you? Explain that communication is key in a relationship, and you just want to be able to discuss things calmly when there is something that is upsetting you, and relay your fear for your life. (Research any cases in history where improper used battery storage has injured or killed someone and then cite one or two here) Let him know that you do not want that to happen to you, your pets, him, or your home. Some people are difficult to talk to, as they get very defensive. Make sure to use the I statements because they cannot argue your feelings. You are entitled to feel how you feel, and if they try to argue your feelings, tell them that. .If the answer to my questions are true, you might be married to a narcissist. They are in relationships to have their needs met, but will not do anything to meet your needs. You have a whole different issue if this is the case. Hopefully, it’s not, and it’s just this one area. Good luck. Great idea! My mom always used tackle boxes to organize her sewing and craft things. She said the boxes made for sewing and crafts never really fit things right. As an adult, however, I have neglected this little method. This is a great reminder 🙂 When we’re organizing our new home, I’ll be checking the fishing section! Yep, check the fishing section! Thanks, “smart one”. 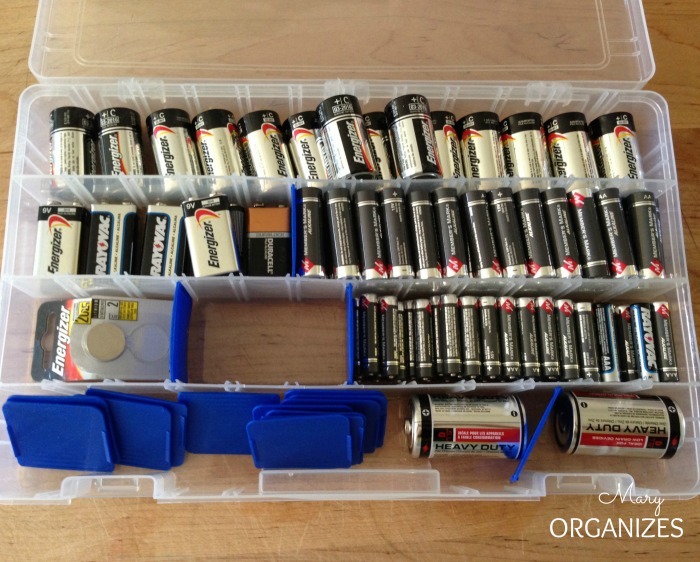 For years, I’ve struggled with batteries and where to keep them. Never thought of this. I will look for one as soon and I go shopping. Good luck with the battery master-er. I had to go to a part of the store I don’t usually visit … I checked the hardware department and the fishing section. Good luck! I ordered something on Amazon that I thought would be like the one pictured, but it seems too small and the inside removal dividers are oriented differently. Can you post the dimensions and brand of the one in the photo, if possible? I can’t find a brand on it. The batteries do fit very tightly? I got mine at Walmart in the hardware section or the fishing section. It is now getting to far in the past for me to remember exactly! It looks like Flambeau with Zerust from Walmart! Happy organizing!